firmly says that ending the night early is from the election commission and rules are meant to be followed. “We can’t do anything,” he says. T most of the places that Alvaro handles; he admits that they try to make as much business as possible during noon and sunset. “There are parties starting from 3 pm to 11pm, so that everyone gets a chance to enjoy at least in the day if they cannot in the night and we do not lose on customers. However, we do not have any big events and Easter will be a dry day, so no plans,” says Miranda. Similarly at Cohiba there are live bands at Sunday’s noon since the nights are empty. 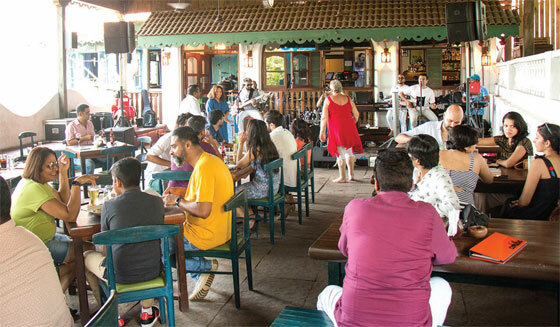 Cohiba which has been quite popular and alive during the nights now experience a lull “Recently I travelled to Mumbai and found that there the clubs still ran during nights, maybe no alcohol is served, but there is food and live music after 11 pm. Only in Goa this is happening strictly, which is affecting the foreign tourists too who are not aware about the code of conduct,” says Bhakhle. Some party freaks have admitted that though the season has been down, they have saved money by not partying a lot. , who has been to most of the night clubs in Goa, says that for common men it affects really bad. “After work we just need to refresh our mind and get all the stress out, where do we go? Unlike most people who find solace with quiet places, some of us relax by hearing some good music, dancing and being around friends. I am disappointed that now I barely go out at nights, but it’s also saving a lot of my money. I guess its fine for a small break for me.